Brother PocketJet 7 Developer's Kit - Bob Johnson's Computer Stuff, Inc. Brother Mobile Solutions' PocketJet 7 series offers significant improvments over previous PocketJet printers. These improvements include, printing performance, wireless connectivity, battery life, and OS compatibility. A specialized kit for developers needing Brother SDKs, configuration software and additional documentation. The PocketJet 7 Developer's Kit includes documentation, USB cable, Li-ion battery, AC power cable, fanfold paper stack and cut sheet paper stack. 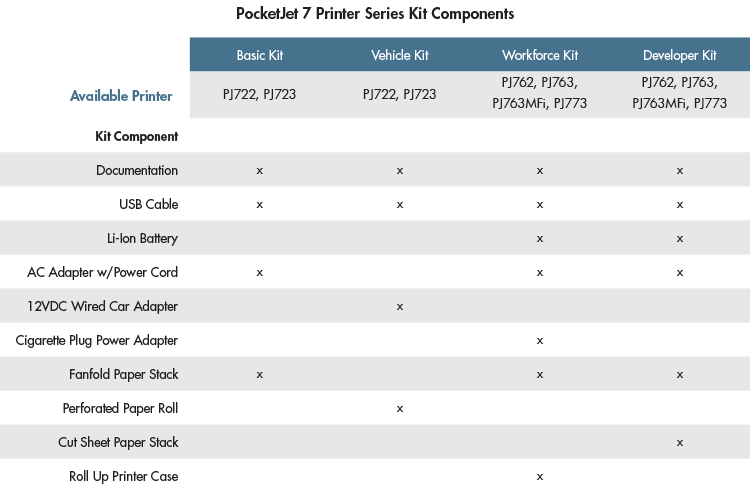 There are four printer models offering different wireless connectivity/print resolution, the PJ762 (Bluetooth, 200dpi), PJ763 (Bluetooth, 300dpi), PJ763MFi (Apple AirPrint, 300dpi) and PJ773 (Wi-Fi, 300dpi).